Alex from Canada has build a 16′ Sea power and launched it for the first time a few days ago. Please watch his nice video from the launching. Alex has put a 50 hp Mercury outboard on the boat but he had some troubles with getting it running, so he will send a new video of the boat sailing when the outboard is up and running again. Anticipation is the enemy of many boat builders. From novices to experienced pros, the excitement of finally sailing the vessel they’ve been building for weeks or months can get the best of them. This can lead to making mistakes that might impede their success. But there are ways to cut some time from your construction schedule without hampering the end results. As a matter of fact, I have 5 shortcuts that will let you finish your project earlier than you thought, without causing any heartache. Bigger is not always better. This holds true when it comes to boatbuilding workshops. While the tendency is to create a workplace that is large and sprawling, just the opposite can be what you actually need. Unless you plan on building boats on a regular basis, you can follow in the footsteps of those who’ve gone before you and create a small workshop. A garage or shed, a tent, some PVC pipe with tarps draped over it… all are standards when it comes to boat work areas. All you really need is enough space for the finished boat, plus a few feet around the perimeter for walking, working and moving about. Sure, there is a special tool for making fillets, but it requires some getting used to. In addition, you’ll need some patience while you’re mastering the art of fillet making. One of my favorite shortcuts involves using plain old plastic spoons to make fillets. Use the back of the spoon to make the curved shape of your fillet. Plastic spoons are sturdy enough to handle the thick epoxy, durable enough to stand up to the resin without dissolving and make cleanup easier than you could imagine. Once you start transferring the dimensions from your boat plans to the plywood, you’ll want to make sure you stay neat, clean and organized. Getting measurements mixed up or forgetting whether you’ve already transferred some measurements can lead to disaster. Buying downloadable boat plans is the way to go. Once one set gets cluttered with notes and markings, simply throw it away and print a clean set. Nothing could be easier. When building a boat, you should always be looking ahead. Read instructions (such as those for the epoxy you’ll use), go through processes (like fillet making) mentally or actually try it on scrap wood. These save you time in the long run because they allow you to encounter the hazards that might happen before you actually begin attempting the steps on your boat. Many problems with epoxy are due to having an incorrect temperature in your workspace. You’ll want your workshop to maintain a constant temperature between 41 degrees Fahrenheit (5 degrees Celsius) and 100 degrees Fahrenheit (38 degrees Celsius). This way, most epoxy products will work as they should. If need be, plan the phases of your boatbuilding project so your use of epoxy will fall during seasons that have temperature ranges compatible with the product you’re using. By implementing these 5 shortcuts, you’ll find you can shave a bit of time off of the total project. That means you can set sail sooner with full confidence that you’ve built a top-quality vessel. 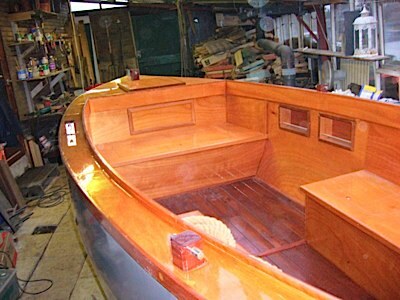 When talking stitch and glue boat building wood joining are often done with fiberglass and epoxy. This wood joining method is really excellent and flexible for many types of wood joining jobs like joining hull panels, frames etc. However for some jobs we prefer other more traditional and old fashion types of wood joints. This is specially the case when working on yachts and small boats superstructure and interior. The post is about the different wood connections and how to make them. Let us start with methods for joining wood boards edge to edge. The most simple is to glue the boards together. This requires the edges to be newly machined and level. However when you have obtained this the joining method is really useful and when using the right glue also strong and durable. Another common way to joint two boards is using tongue and groove. This method does not require as much care and in most lumber stores you can buy the boards ready made for assembly. One variant of the tongue and groove joint often used in boat building is where the two edges both have grooves and they are then assembled using a loose tongue. This method is especially useful when the boards don’t have straight edges like dunnage made of plywood sheets. Beside joining boards edge to edge you often want to join wood corner to corner like in picture frames etc. When talking this kind of wood joints there are also several different kinds of joints to use. First and most simple is the miter. Even though this joint is widely used in many applications it is a joint not really interesting in boat building. The joint is weak and does not have any structural integrity, so beside the picture frame for the owners picture on board it is not used. Now if joining two wood pieces corner to corner is necessary there are some other techniques you can use. First there is a method you can call split joint. Here you half the two pieces before joining. Another method is to make a slot joint where one piece has a tap and the other has a slot. An important issue here is to make the joint with the right proportions so it get as strong as possible. 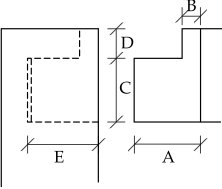 The proportions should be 3-4-3 as shown on the figure below. An interesting and useful variant of the tap and slot joint is one where the slot is replaced with a hole. This joint is a real decorative and strong connection. It is important to make room for the glue when making this kind of joints. Beside joining boards like in picture frames you can also joint the boards like in a box. This is often used when making superstructure like cabin sides or cockpit sides. An important issue when joining the wood boards this way is to protect the end surfaces from weathering. As you can see from the illustration not all end surfaces are protected. If you want that and believe me in the long run you want, you will need another method for joining the camin or cockpit sides. The above illustrated method for joining the wood boards is really great when you want a durable, nice and strong joint. Here you also have the advantage of being able to make nice round corners without loosing strength in the connection. One last connection in relation with the joints here is one that I can’t recommend using outside. This connection is mostly used when making drawers and it does not protect the end surfaces. Therefore it is a joining method only suitable for interior use. The method is widely used in industrial products because it is easy to make on machines and easy to use on uniform items. This was a short list of some of the wood joining method used in boat building. Most of the methods have roots within carpentry and are as such developed during generations but some are developed especially for boat building and ensure nice and long lasting wood joints proven in generations. It was from Rolando Perez who has build the 15′ Daytrip canoe from the free plans available. Rolando was impressed by the performance and it exceeded his expectations. I have written about Marcel and his Picnic Barge before. Marcel from Holland is now close to being finished with the 17′ Picnic barge. Marcel has done a great job with the boat and we are all looking forward to the launching.